I really enjoyed this story. it had warm characters and an interesting plot which didn't just depend on the characters not telling each other their true feelings which annoys me. All I can say about author Jo Beverley's novel Secrets of The Night, is after finishing half the book I downloaded on my Kindle 10 more of her books. Yes I thought this book was that good. I loved the Hero, Brand and the Heroine, Rosie. I could go on and on about how wonderful and believable the characters were, or how incredible good the story was but just go out and get the book you will see for yourself. The premise of the book is about how Rosie, Rosamunde Overton who being married at sixteen to an elderly man is still childless after seven years of marriage. When her elderly husband's inability to sire an heir threatens everyone she cares for, young Rosie is forced is forced into a daring deceit at a scandalous masquerade. But then her nerve fails and she flees, ready to give up all hope ... until she rescues an injured nobleman who just might be the answer to her prayers Although Lord Brand Malloren lives far above the station of the mysterious lady who has taken him captive and captured his heart, he's only too willing to follow her lead. Rosie too has fallen in love, but her reckless plan depends on secrecy. For to reveal herself could cost her everything. 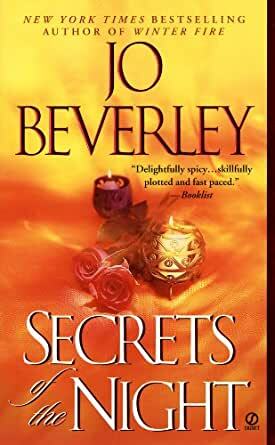 This was the first novel of Ms. Beverley I have read and Secrets of the Night is part of a series of books called Malloren World. Each book in the series can be read separately, this was book four in the series and as I stated was my first novel by this author. I strongly recommend this book for an entertaining romance read. On a passion scale I would put this at a 6. 5.0 out of 5 starsMy favourite Malloren book so far! Intriguing plot and sizzling love scenes add to the fast pace and character-driven story. As,always, impeccable historical details and descriptions immerse the reader into the lovely English countryside. Delightful! Just the right mix of Georgian glamor, love for the beautiful land, and sensuous romance, reliably delivered by JoBev to a hea. A very satisfying read, which I plan to revisit after I enjoy Rothgar's tumultuous wooing in "Devilish." Jo Beverly's books are always a great read. They give the reader a chance to escape into the 18th century, and into the world of mystery and romance. Jo passed away recently, so there won't be anymore romances. She left us a beautiful body of work, and I will always appreciate her books. I have read many of Jo Beverley's books. They are awesome!! Quick reading, too. They keep your interest and makes you want to read about more of her characters.